3.000 years ago, in the Chilean Andes, native people made thousands of perforated stones apparently for no reason. Mapuche tribes discovered those, many years later. Seduced by the mystery of those stones, the mapuche named them: Katankura, which means “stone with a hole” in Mapudungun. The Santa Fe farm is located in this place, which has a privileged Mediterranean weather and receives the rich waters from the mountains through two rivers: Ñuble and Cato. This place hides another mystery, the black truffle. 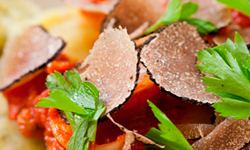 The black truffle is a symbol of the “haute cuisine” for its rarity, intensity and incomparable flavour, which is a mix of attributes from the earth, vegetation, water and weather of its habitat. The 21st Century brings the challenge of growing this precious truffle outside of Europe. The province of Ñuble in the south of Chile, a blessed region for its generous nature, is today the cradle of our black truffle. 15 planted hectares lie in the beautiful scenery of the river Cato near Chillan. 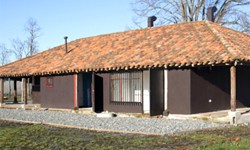 Our cottage which has been converted to a factory is located right in the middle and supplies customers all over Chile. 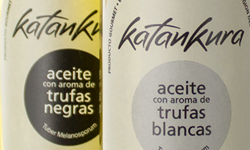 A wide range of oils, creams, juices, dehydrated and other developed products based on truffles and other wild mushrooms from the south of Chile. 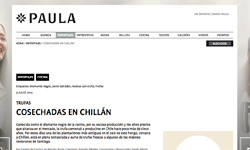 Inform yourself about press releases and journalistic articles about our company and truffles in Chile. Here you have access to a selection of gourmet recipes to enjoy the full flavor of the truffle: aperitifs, appetizers, salads, main dishes and desserts.